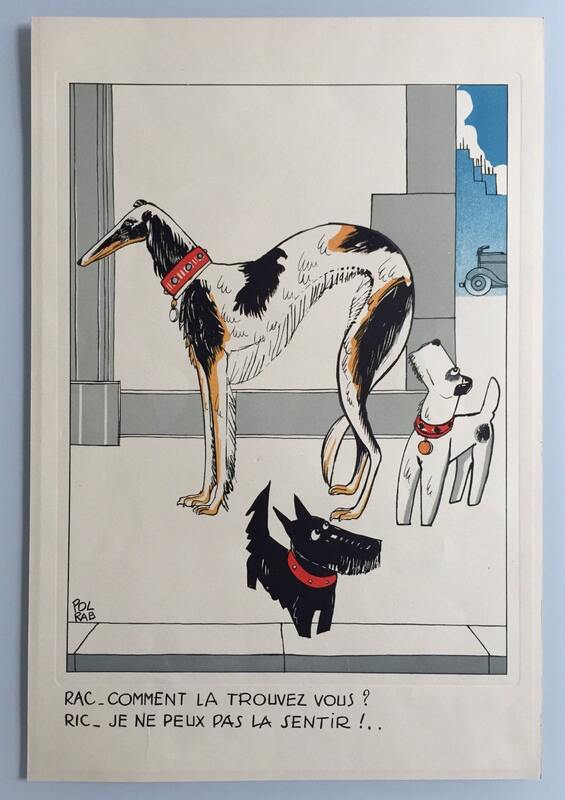 Very rare lithograph by The French cartoonist Pol Rab. He signed his art and even referred to himself by the moniker for which we know him today: Pol Rab. An artist and illustrator who seldom if ever produced a painting intended simply to be ‘hung on a wall’ Pol Rab provided memorable art for all of the media mentioned above and then some; intended for a broader, ‘common’ if you will, audience. This included posters for theater and for travel, musical theater program covers, sheet music covers, postcards, and advertisements. He is most famous however for his cartoon about the adventures of a wire fox terrier named Ric and his buddy a Scottish Terrier named Rac. 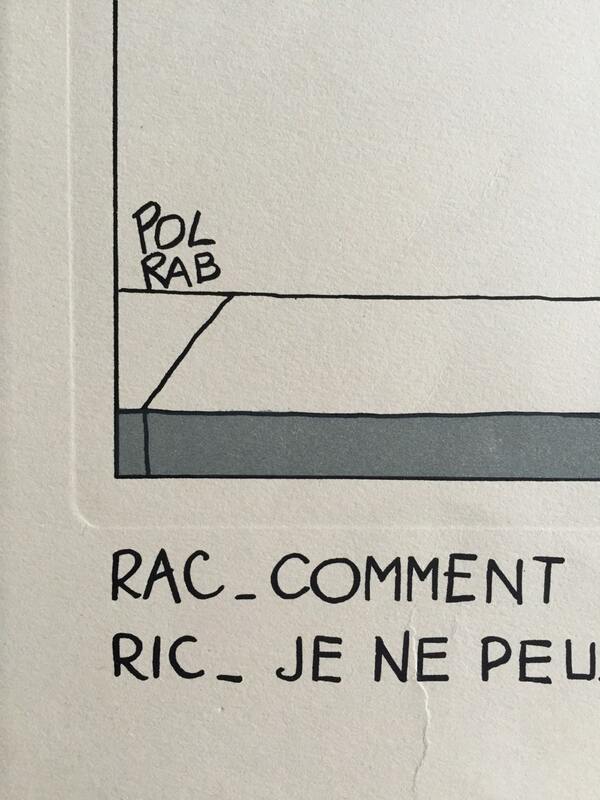 Ric and Rac became a phenomenon bordering on an obsession in Paris and beyond. Transcending ephemera, the Ric and Rac were soon translated into pin and pendant jewelry both cheap and expensive, into sculptural objects ranging from lamps to cocktail sets, and into utilitarian items from cosmetic cases to shoe-polish tins. There is some evidence that Ric was the source of inspiration for Tintin’s Snowy (Milou) and for the famous Lea Stein terrier brooch. Some believe Ric and Rac helped establish terriers as the only dogs used in Black & White Whiskey advertising; various other breeds had appeared previously. Paul Abraham – Pol Rab - was born in 1898 and unfortunately died in 1933 at the early age of 35; one wonders if he had to give up membership in the ‘under 30’ club that he had founded. It follows the adventures of Ric and Rac, two terriers who get up to all sorts of risqué adventures! 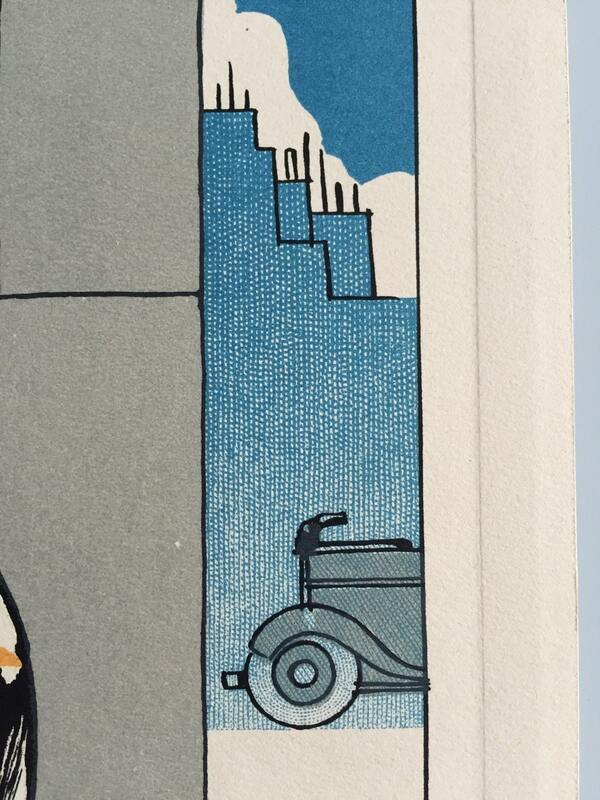 This print is an original from the height of the Art Deco period. 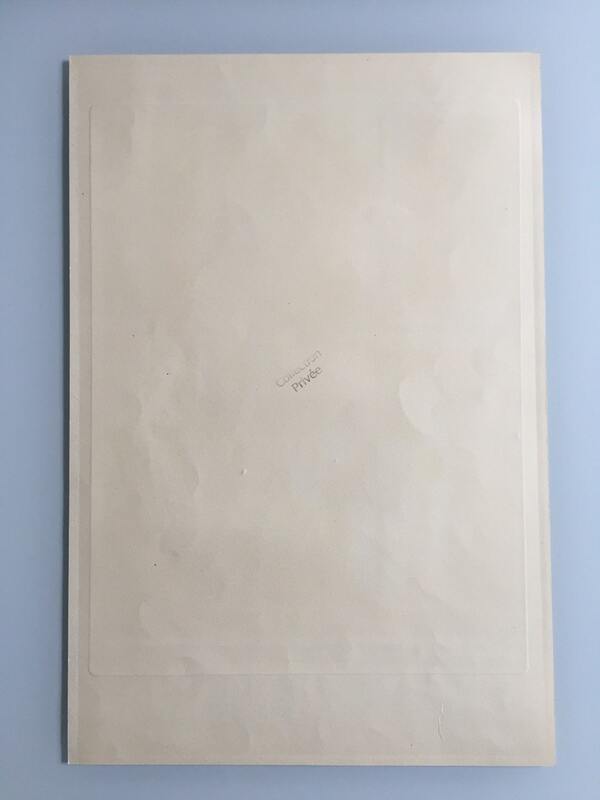 In very good original condition, ready for framing. Size is 12x18 inches.